Over the years, you’ve trusted your ears to collect sounds from the world around you. They’ve warned you when there’s danger. They’ve allowed you to enjoy music. They have been invaluable when following directions or carrying on a conversation. Many factors can cause hearing to diminish as we age. Some are more controllable than others. But what about cold weather? Can it really affect your hearing? Or does the cold’s negative impact on your health just amount to an “old wives tale”? Your ears are made up of very delicate tissues, membranes, and bones. In order to hear the world around them, they had to be positioned in very vulnerable places on the sides of your head. This location makes them great for hearing, but it exposes them to bitter cold winds and water from the air, sweat, tears and melting snow. You might only think of frostbite on the outer ear when you think of cold ears. But the middle and inner ear can face just as much peril in the cold. Being bundled up and walking with friends through a fresh snow may be one of the greatest delights in the world. But if your ears aren’t covered, it can also increase your chance of getting exostosis, or surfer’s ear. The dry and unrelenting winds can force cold rain or snow into your ear canals. But if you have exostosis you won’t be able to tilt your head and force it out. In those with surfer’s ear, the ear actually attempts to protect itself from repeated exposure to the cold by developing a bony outgrowth in the canal. The outgrowth tries to keep the water out. But it ends up trapping water inside, affecting how you hear. Of course, this condition doesn’t develop in one winter. It takes repeated exposure for the ears to respond in this way. There’s just another reason to bundle up with earmuffs or a scarf just like the loving adults in your life taught you as a child. Even if you don’t develop exostosis, the cold weather can increase your risk of developing ear infections. When it’s cold outside, you have no choice but to breathe in cold air. It may feel invigorating at first. But this breathing in of cold air lowers your core body temperature. This causes vasoconstriction. That’s a narrowing of the blood vessels. Your immune system relies on a free-flowing circulatory system to respond to infections. When your vessels are constricted, your immune system is less able to do its job. This leads to an increased risk of respiratory and ear infections. To reduce your risk, wear weather-appropriate attire to keep your core temperature up and your immune system working as it should. Prolonged exposure to the cold can cause condensation to gather inside your hearing aid. This water will cause damage to the sensitive parts inside. Keep your ears covered and use a hearing aid dryer to avoid water collection. The cold can also make your battery stop working. A battery produces electricity by generating a current of electrons between a negative and positive “terminal.” These electrons power up your device. When a battery is cold, these electrons slow down. They get so slow that they can no longer produce electricity as fast as you’re using it. To prevent this, always keep an extra pair of hearing aid batteries on hand when you travel in cold weather. 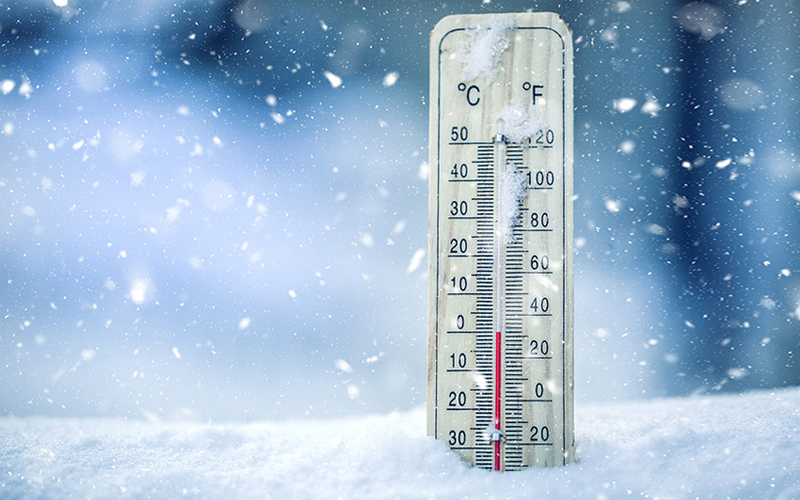 The cold can impact your health and hearing in surprising ways. Protect both this winter by bundling up and taking precautions through cold weather months.